Ask any young Belarusian who they want to be when they grow up. 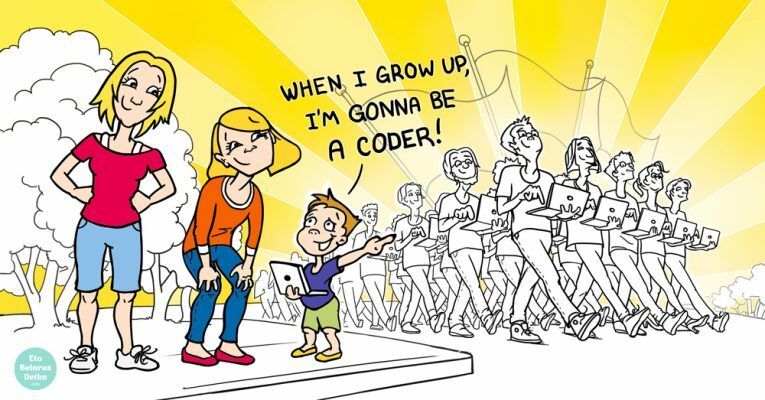 The most frequent response is likely to be “software developer”, just like their older brother or sister. The popularity of this profession has developed quite remarkably in recent years. However it all makes a lot of IT-sense when looking at the past, future and present . The past reveals that software engineering has been running through Belarusian veins for quite some time. During the Soviet period, Belarus was considered to be “Silicon Valley”. Because it used to manufacture over 50% of the USSR’s computers and computer parts. Since the 1960s, Belarus has become a software developer hub. Very many smart boys and girls who were really good at math at school quickly learned IT science. They knew how to navigate their way around computers, technology and programming languages during the boom in the 2000s. It came naturally to them, it was almost like a game of chess. Solving interesting problems on the fly. It won’t surprise you when we tell you that World of Tanks and Viber are both genius Belarusian inventions. And inside every programmer there is the silent hope that maybe he or she will develop a similar ingenious concept. The future tells us that the IT sector will develop further and further. It will happen for a couple of good reasons: the first is that you can get rich! Hurray! Someone in their 20s can be earning twice or even three times more than their 50-­something, experienced and professionally active parents. Just because he knows how to code. The second reason is the foreign trips and foreign payments attached to this profession. Which are quite an attractive bonus for almost anyone. The present picture of Belarus shows an entire ARMY of Belarusian software engineers. Some working here for high pay, others working for export as freelancers. And a lot moving to other countries for even higher pay and cooler jobs. To be or not to be a programmer: that’s almost a no-brainer for the average Belarusian mathlete geek.